The material of this installation is both light and lack there of presented in the form of the darkened basement space of the gallery. It is within this unrecognizable emptiness that light can reveal the density of darkness. For a viewer, however, the experience may prove discomforting. Upon realization they can’t recognize new surroundings their senses become more acute. The density of darkness blends with humming noise. 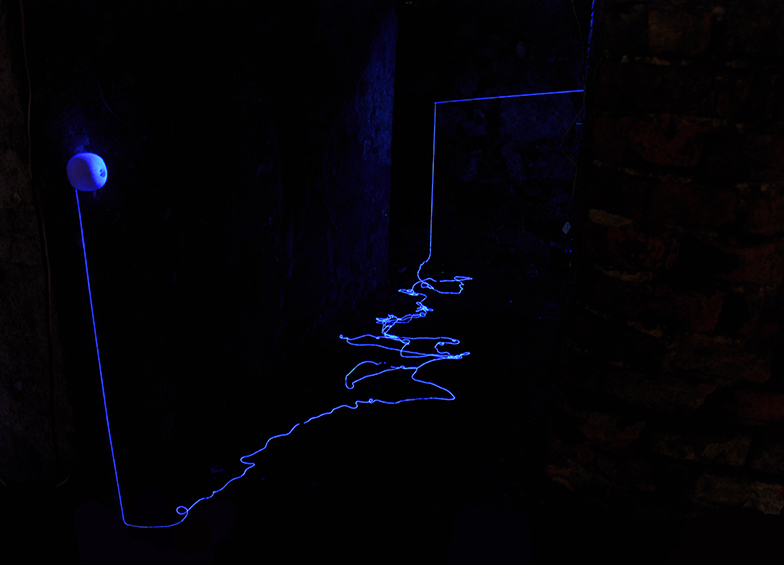 Using visible drawing of white yarn line, the viewer attempts to determine distances, make out uneven earthen basement floor and finally reaches the mirrored door. It is visible reality that I turn on and off. For the last dozen or so years I have been creating installations relying on stable electricity supply. It takes only a minor glitch and the installation is done for, along with visible reality. 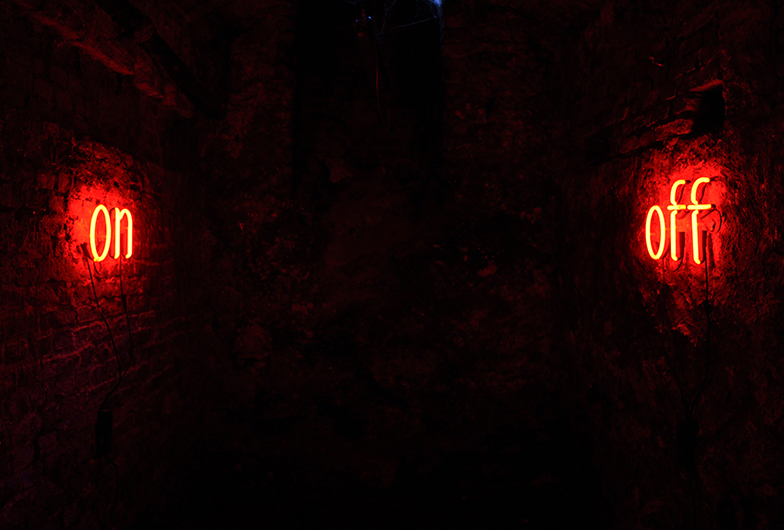 One of the neon lights was damaged during the assembly of this installation. If not for the help of the manufacturer, the whole exhibition would not have been completed this time. For a couple of years I have been fascinated by the notion of illusions – the difference between what we see and what we know that we see. I have reached the point where I doubt in the world reduced to visibility. Of course the visibility can be alluring, easy and common, and it takes only one push of the button to either summon or lose it. The remaining SHADOW is mental reality.